Baking a cookie into a bigger shape than one normally expects for such a dessert is so late ’90s — your birthday party had a “normal” cake instead of a huge chocolate chip cookie with frosting writing on it? Lame! — but that hasn’t stopped Pizza Hut from joining the party now. The pizza chain has announced a “new” menu offering, a cookie pizza. Which yes, is a giant chocolate chip cookie, sliced like a pizza. Debuting as the Ultimate Hershey’s Chocolate Chip Cookie but known by company insiders as a pizza cookie, the giant cookie is the result of a partnership with Hershey Co. and will sell for $4.99 a pop with a pizza or $5.99 if you buy it on its own. No one at Pizza Hut has apparently ever baked cookies, from the sound of it, thus creating quite the stir. 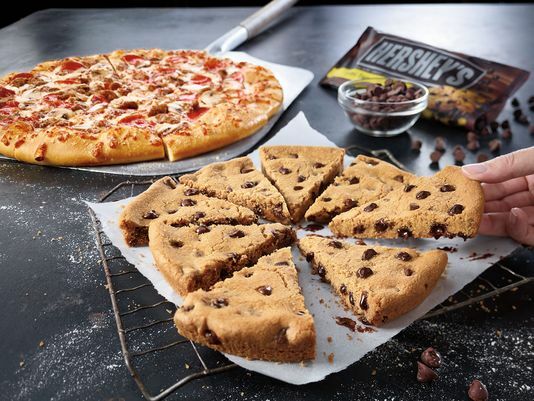 The pizza cookie will officially debut on July 16 during an event at all 6,300 U.S. Pizza Hut chains, with 10% of each cookie sale going to the World Food Programme.